Treat long, dry beards with the Proraso Hot Oil Beard Treatment. The treatment nourishes and injects moisture into dry and damaged beards to promote healthy hair growth. The gentle yet powerful formula will leave your skin with a subtle scent of cedarwood and Mediterranean citrus. 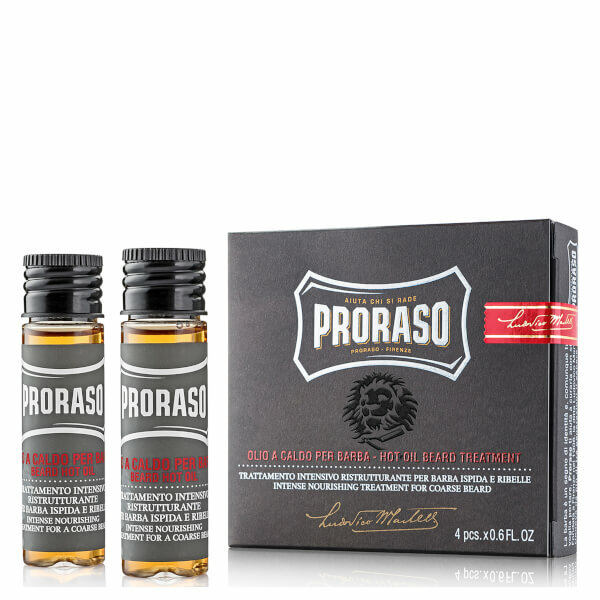 Boost your beard and ensure that your facial hair is always looking tip top with the Proraso Hot Oil Beard Treatment. A.B. Immerse the phial in a bowl of hot water (not boiling) for around one minute. Dampen your beard and rub oil into your beard, starting from the roots and working to the tips. Leave it on for around two minutes and rinse. I recently received my purchase of the Hot Beard Oil by Proraso. It was absolutely amazing! My beard never felt more alive, the fragrance was truly divine. I'm really impressed and recommend this product for those who desire to grow a long and lush beard.